I was born Deaf and have been Deaf my whole life. I do not wear hearing aids or cochlear implants (and have no desire to wear either). I speak American sign language (ASL) and it is my primary language. I am a mother of two born-Deaf children, so our being Deaf is genetic for us. I have a voice in my head, but it is not sound-based. I am a visual being, so in my head, I either see ASL signs, or pictures, or sometimes printed words. My inner voice does have words, concepts, and thoughts. My mind is not blank, nor is it silent. I process information through my brain, my eyes, my nose, my tongue, and my touch, all in the same way anyone would process their information. Sound just isn't part of my thought process, and because it's not part of my thought process does not mean I don't have an inner voice. I do. I was born deaf. I did have speech therapy at an early age, and growing up, my inner voice is figuratively speaking to me and I hear it as well as lipread it. This is the same voice that I imagine people have when they read blocks of text and hear in their head. I don't exactly see some creepy "Voldemort" face in my head, but I always have some image of lips moving along with a voice that I hear. At the same time, I do have memories of when I was little and didn't speak at all, and all my memories were heavily visual and olfactory. I would always remember specific images of locations and could describe them to my parents in vivid detail trying to figure out what I was remembering. Before speech therapy - my inner voice was highly visual. Now, as I'm learning/studying sign language in my free time, I'm finding that my inner voice has grown hands as well and I sometimes read things and hear a voice, lip read, and see signs all at the same time. I would expect that a similar experience happens with those who are bilingual/multilingual and sometimes hear all languages at once when reading a text, or perhaps sometimes it switches languages in their heads (although it is a little different because they would hear in whatever language they're reading in for example). These two cases are not enough to be generalizable, but they are very suggestive. 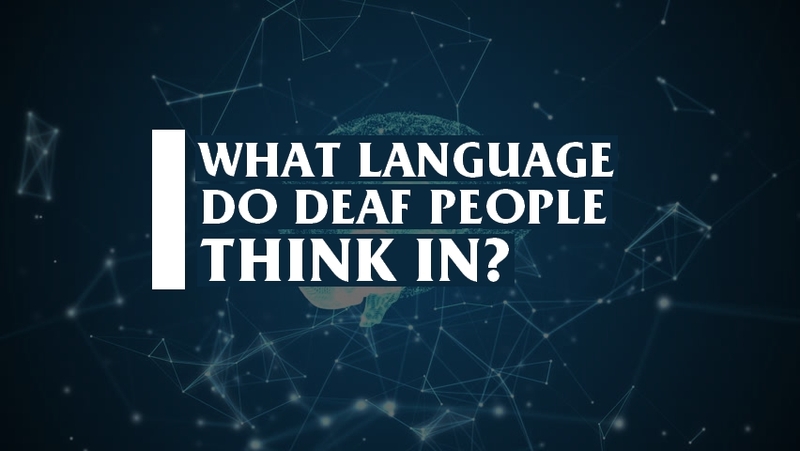 Verbal language is not part of the experience of deaf people, they have never been exposed to it at any period in their lives and so they can't possibly think in verbal language. Their thoughts most certainly include the language they use: sign language. Which is just as sophisticated, as expressive, and as beautiful as the language you and I use.